Came across SecurityKiss who offer 300MB per day VPN free. Setting up an account is easy, and then you need to get it going. 1. 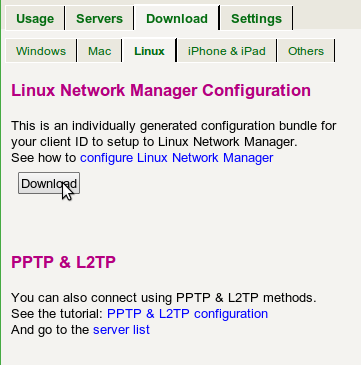 Log into the client area and then click 'download' and then 'linux'. it needs to be "1"
4. Start the network configuration, by clicking on the wireless symbol in the menu bar, dragging down and selecting "VPN Connections" > "Configure VPN" and then "Add"
5. Select OpenVPN and then "create"
6. Put in the following. enable "Use a TCP connection"
I would guess this works with other Linux distros as well. 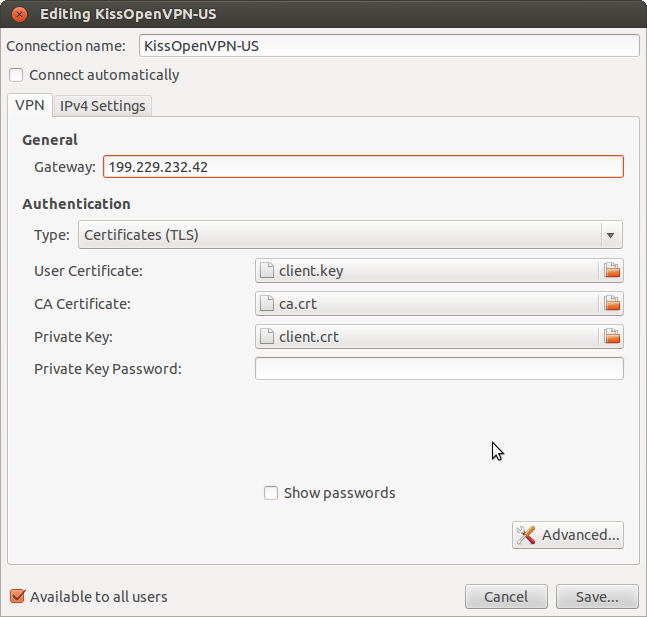 You don't need to turn on IP forwarding for the openvpn client unless it is acting as a gateway for other hosts. And you'd need to use iptables masquerade too on the tun0 device. This makes it NAT all connections going over the vpn tunnel. You may want to consider putting firewall rules in place to protect you from the other end of the vpn tunnel from attacking you.. treat it like a WAN connection. Setting up an account vpn tunnel is easy, and then you need to get it going.